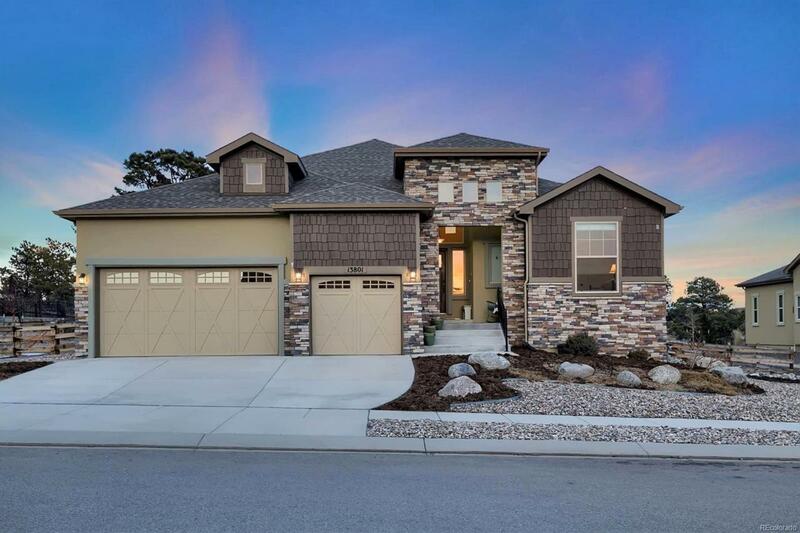 Stunning rancher backing to Open Space. This open floor plan draws you into the great room with soaring ceilings, wall of windows & cozy stone fireplace. The beautifully appointed kitchen boasts a large center island, gas stove w/ hood, convection microwave/double oven, granite counters, pantry & adjoining dining nook. Unwind in the main level master retreat w/ walk-out to patio, 5-pc bathroom & walk-in closet. The main level features 2 secondary bedrooms adjoined by a Jack-&-Jill bathroom & home office providing the ideal quiet work space. The finished basement offers a large family room w/ gas fireplace, gaming area & wet bar. 2 spacious secondary bedrooms, 2 full bathrooms & abundant storage spaces complete the lower level. Enjoy entertaining on the sprawling patio overlooking the beautifully landscaped yard w/ water feature and hot tub. Excellent location, just minutes from I-25 with easy access to downtown Co Springs or Denver, USAFA, & award winning District 20 Schools!